Posted on Thu, Jan 12, 2012 : 4:37 p.m.
Crews tear down the remains of a Mobil Gas Station at Grove and Rawsonville roads. 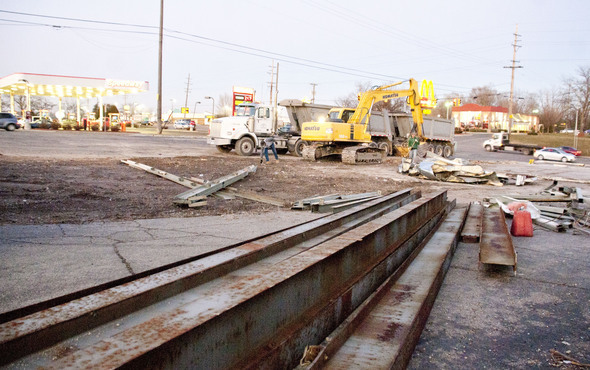 Following legal pressure from Ypsilanti Township, the owner of a former Mobil Gas Station at Rawsonville and Grove roads has torn down the building. Work began earlier this week, and officials expect the site to be totally cleared by the week’s end. The owner and his attorney argued to the Ypsilanti Township Board of Trustees at its Dec. 6 meeting that the structure was sound and not in danger of collapse. But the board voted to approve legal action at the meeting, and the township filed a lawsuit in the following week. A contractor pulled a demolition permit last week and began working immediately. Mike Radzik, director of the township’s office of community standards, said the owner of Ypsilanti-Grove Properties and his attorney, Jerry Hamling, wanted to avoid a lawsuit but were refusing to tear down the structure, which the township had deemed in imminent danger of collapse. Hamling did not return calls from AnnArbor.com. On Oct. 4, Ypsilanti-Grove was served an order to demolish the structure at 3360 South Grove Road within 30 days or face possible legal action. Because the property has been abandoned for over 30 days and is no longer used as a gas station or suitable for use as a gas station, it is considered blight under township ordinance. Among other issues, building inspectors contended the canopy’s columns had deteriorated at their base, the canopy was twisting in some areas and the beams were disconnecting from their footings. 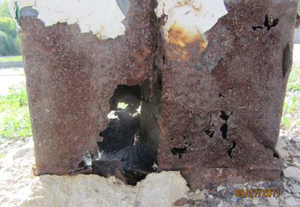 Some of the beams had deteriorated so badly that it was possible to see through the holes in the steel supports. Photos showed that some of the beams had deteriorated so badly that it was possible to see through the holes in the steel supports. Portions of the canopy also were supported by drainage pipes and part of it had begun to deflect. Hamling argued that the canopy was structurally sound. He told the board that photographs of rusted out beams only showed metal wraps around beams that are there for aesthetic purposes and there were actually four-inch steel beams inside those wrappings. Township officials disagreed with that assessment and questioned why Ypsilant-Grove wanted the canopy to remain. The property carries a deed restriction that prevents another gas station from being built there. The owner said he was in negotiations with Taco Bell for four years before they opened a location across the street. He also had been in discussions with CVS and Chase Bank, but no deal was struck. Radzik said Ypsilanti-Grove owns a strip mall in Van Buren Township that was in poor condition when Ypsilanti-Grove bought it, but the company had redeveloped it into a nice plaza. He said he hoped to see the same happen Ypsilanti Township. and that was definitely an eyesore and contributed to negative feelings at one of our main entryways. We’re glad it’s gone. Sat, Jan 14, 2012 : 5:10 a.m.
Good job here Ypsilanti Township! About time that building was done away with! Sure that the other businesses on that corner are glad to see it gone too. Ok I'm confused. Is this the Mobil located on Rawsonville as you exit 94 or another gas station ont he corner of Grove and Rawsonville? Were there 2 Mobils on that stretch of Rawsonville? Fri, Jan 13, 2012 : 4:11 p.m.
No. It was a Clark or some no name brand that closed because Mobile updated their gas station. This pretty much gave the two on the corner a run for its money. One didn't have enough to keep up and the other renovated. Fri, Jan 13, 2012 : 1:14 p.m.
Fri, Jan 13, 2012 : 4:10 p.m. Isn't that by 94 and Whittaker? By that school? If so? They are renovating that property as we speak. Fri, Jan 13, 2012 : 1:04 a.m.
&quot;Because the property has been abandoned for over 30 days and is no longer used as a gas station..&quot; I wish the county was more aggressive like this on all of it's landlords. I know this gas station has been empty for years, not just 30 days, and was an eyesore. But let's keep it rolling. Lower rent and get businesses in, or start paying fines. Fri, Jan 13, 2012 : 4:09 p.m.
Another article just mentioned another blight bit the dust. Good going Ypsi Township. Thu, Jan 12, 2012 : 11:12 p.m.
Fri, Jan 13, 2012 : 4:08 p.m.
How bout a nice buffet style resturant? Give Denny's a run for its money. Golden Corral could be a nice addition. Anything but another gas station. Fri, Jan 13, 2012 : 2:49 p.m.
Too bad a Panera wouldn't do well enough there. Fri, Jan 13, 2012 : 1:38 p.m.
yeah because we don't have enough fat kids running around and that intersection doesn't already have like what 5 fast food locations?